A derma roller is a hand-held device that contains tiny, wafer-like needles that penetrate the top layer of skin. This treatment process commonly referred to as micro needling or skin needling can be used to treat various conditions, mostly related to scarring or aging. The micro-needles puncture the skin, which in turn stimulates new collagen and elastin to form. It can be used on the face, neck, chest, hands, and on stretch marks anywhere on the body. We are seeing especially good results with lines under the eyes. A variation of the technique is to use a Derma Pen – essentially performing the same process for smaller areas like under and around eyes. We offer both Derma Pen and Derma Roller treatments and your therapist will choose the best option. The objective of micro needling is to rebalance the elasticity of the skin. During your first consultation, our experienced therapist or the plastic surgeon will recommend a proprietary skin care regime to prepare the skin for the procedure. To make to the procedure as pain-free as possible a topical anaesthesia will be applied. The derma roller is then applied in a rolling motion over the areas to be treated. The entire procedure generally lasts from ten minutes to just under an hour, depending on the size of the treatment area. 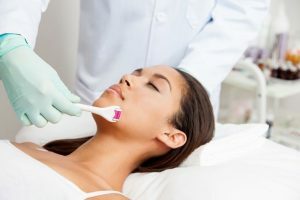 Patients may recognize improvements in their skin within a week of beginning treatments, although it varies depending on the type of condition being addressed. It may take months to see significant results.